Dashing in between rain drops..that is the pattern lately, I grilled some sirloin for steak fajitas, chicken sticks with sesame seed..beef kabobs drizzled with blue cheese dressing..homemade cole slaw.....grilled baby back ribs and grilled hot sausage..
Grilled peaches, pineapple and fresh cherries add a little sweetness. As always, thank you for your visit...And thank you Debbie for hosting the BBQ party. I have a matching crab to yours..can't find him...where did you get yours..I am thinking Pier One for me! Kathleen, you cooked up a storm! It all looks very, very good. I hope you get a break from the rain. Very pretty tablesetting. Oh my, what a feast, Kathleen! Everything looks fantastic. I love fajitas but don't make them nearly enough. 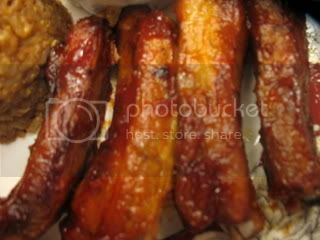 Kathleen, we can always count on a wonderful meal from you! Would love everything you served, and your patriotic tablescape. I spy the filled strawberries...so "sweet" of you to make those. I enjoyed the scenes in your mosiac, you live in such a beautiful part of the world. That's one super duper meal, Kathleen! I love it all! You could use a puppy at the table looking longingly at those sirloin fajita's! Beautiful table as always, love the red, white and BLUES! More rain for this week, too, that couple hours of sun was nice while it lasted! Kathleen, as usual your food is as wonderful as your tables. This all looks so delish. You did a lot between drops! Your food looks delicious Kathleen and your Flag day table is great! Sorry y'all are getting so much rain..we are dry so I suppose we sent it all your way. 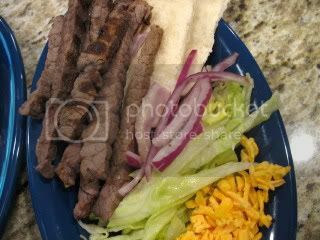 I had thought of doing fajitas on the grill and still have it on the menu for soon. Great post..you killed several birds with on stone! Most efficient! The food and the table look scrumptious!!! Your mosaic is so pretty...love the photos!!! All the patriotic colors are as I call them nautical colors too! Happy Blue Monday. 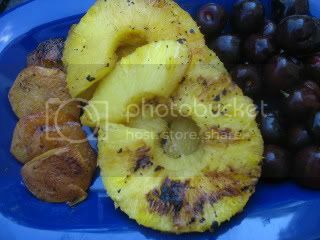 Oh....grilled pineapple! I love it. I just realized that each comment I make to you pertains to fruit. Your pictures always make me crave it. Regarding the mirror....I am thinking about hanging it in a powder room over the sink. Thanks for your beautiful posts on food! OK, I am hungry now! That food looks so good! When's dinner? 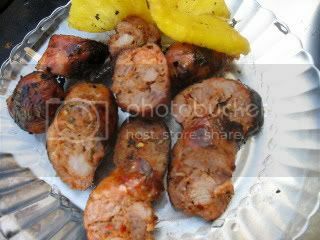 Wow...this not a good post if you are hungry...wonderful post on foods!! Lovely blue plates too. Happy Blue Monday. 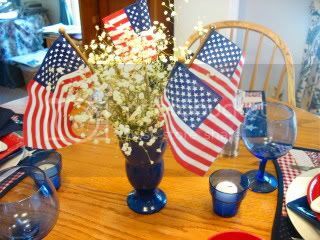 This is what I call a patriotic table arrangement! Great! The food looks yummy. Wonderful post. What a spread- you did an amazing job and your decorations are top rate! Just Beautiful! Im stopping by for left overs! I love your mosaic ! I love your table setting with the R,W and B ! Morning, Kathleen! I haven't even had my breakfast yet and there you go making my tiny mouth water! The food looks wonderful! 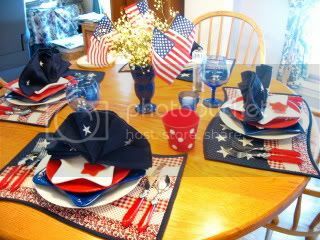 I love your patriotic table setting too! Oh, thanks again for reminding me of you White Day! Yes, I want to participate! WOW, Kathleeen! When you do something you do it all out! 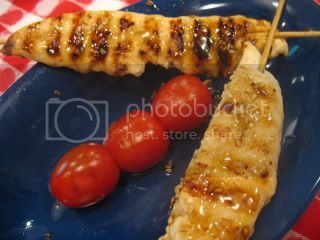 Not only one grilled item but a whole buffet of items. Everything looks so good as always - Mike is such a lucky man with your wonderful cooking. The tablesetting stole my heart - it is gorgeous! I especially love those placemats - where did you get them? The scenes of the beautiful area of the country you live in are wonderful - a great subject for a mosaic. I can believe how many "events' you squeezed into this post ;) Great job my friend! I was thinking a couple of days ago that I should grill steak to make Dennis fajitas. Your food looks so great that I am going to have to do just that. You sure did cook a lot of things.....you must of been busy preparing all day. I love your blue star dish that I see peeking out from under a red one....I let my daughter use all my red white and blue things, guess I am going to have to get them back soon. 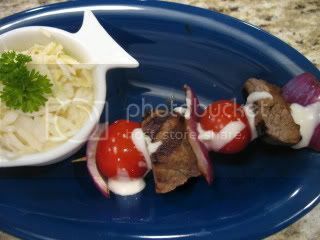 bet your guests had an awesome time...your food looks wonderfully delicious! What a feast! Table looks wonderful. Thanks for sharing and Happy Blue Monday to you! You put so much into this wonderful post, may I ask that you put one more thing in? The link to my blog. Were you grilling for the neighborhood?? What a spread...you probably won't have to cook for a few days. The strawberries look huge and so yummy! I could have a sampling of each and every thing!! 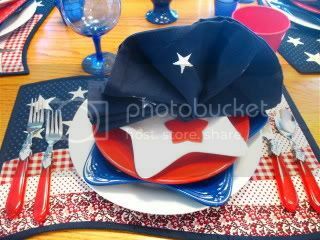 I adore your patriotic tablescapes, they are so bright & cheery..can't wait for the 4th of July one!! Wow what an amazing group of fabulous photos . I love all the great foods,the beautiful table decorations,and all those blues !!!!!!!!!!!! It looks like you have been very busy, the BBQ looks great! 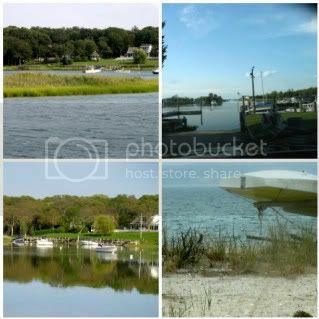 I was also taken with your beautiful photos on the sidebar. 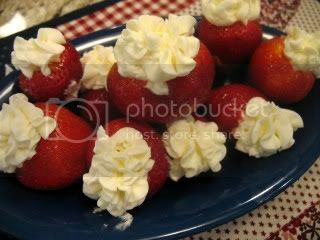 Oh, can I sit at your gorgeous, patriotic table and nibble on those strawberries and grilled peaches? I promise I won't leave a mess! 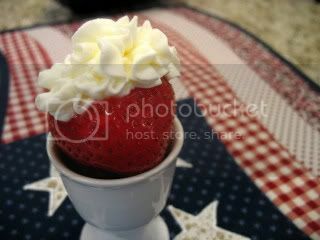 awesome post... had to go get dessert... good thing I had strawberries in the fridge! Your food looks awesome and that tablescape is just perfect! Your menu is Unbelievable...so much delicious food! Love your Flag Day table. You did such a great job honoring it's colors. Wow, the food is wonderful! 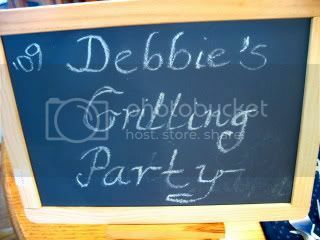 I love the blue platters, and those napkins are the greatest!